The Nightwatch. Photo credit: Livassured. A new high-tech bracelet, developed by scientists from the Netherlands, detects 85 percent of all severe night-time epilepsy seizures. That is a much better score than any other technology currently available. 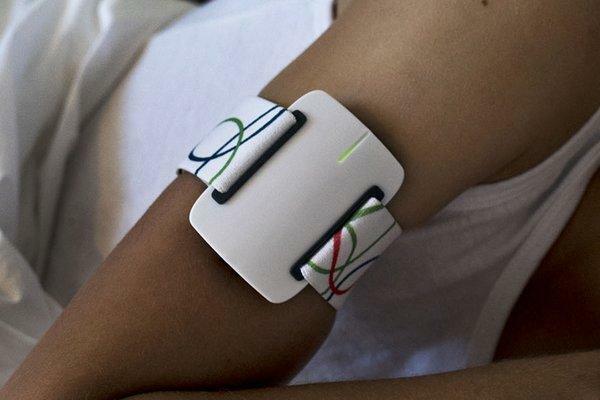 The researchers involved think that this bracelet can reduce the worldwide number of unexpected night-time fatalities in epilepsy patients. SUDEP, sudden unexpected death in epilepsy, is a major cause of mortality in epilepsy patients. People with an intellectual disability and severe therapy resistant epilepsy, may even have a 20 percent lifetime risk of dying from epilepsy. For the sake of comparison, the current detection standard, a bed sensor that reacts to vibrations due to rhythmic jerks, was tested at the same time. This signaled only 21 percent of serious attacks. On average, the bed sensor therefore remained unduly silent once every four nights per patient. The Nightwatch, on the other hand, only missed a serious attack per patient once every 25 nights on average. Furthermore, the patients did not experience much discomfort from the bracelet and the care staff were also positive about the use of the bracelet.